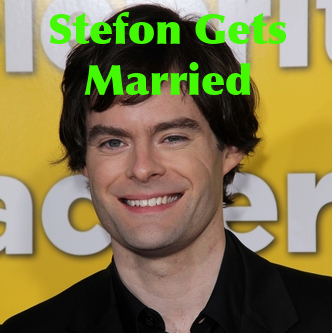 As a fan of Stefon from the start, it’s so sad to see Bill Hader leaving Saturday Night Live and his character behind. Saturday’s season finale saw the hilarious end to the Seth Meyers and Stefon love affair. It’s a tale as old as time and I’m glad it got a proper ending. For an update on what’s going on in the city during the summer, Stefon rolled on in. He was particularly shocked to find Amy Poehler sitting at the desk with Seth. He gave us “PANTS” the hottest club in New York City. It’s located on the fake street from Seinfeld and the password is “SCOTTY.” Don’t miss the human magic eight balls. Amy Poehler had a hard time controlling herself. When Seth said that’s not what he was looking for, Stefon stormed off and said he was getting married to someone a lot like Seth. The girls in the audience let out a really loud scream of agony and Seth tried to keep rolling. Seth Meyers then began to tear up and Amy Poehler sent him off to get Stefon back. Saturday Night Live: Stefon Gets Married… to Anderson Cooper? While he may have denied his love for Stefon from the beginning, we all knew that Seth Meyers loved Stefon. At least, he loved him as a friend. He chased Stefon through the streets of New York to a large church. There he found all of Stefon’s friends and characters from his New York hot spots. Anyone remember what the midgets dressed as traffic cones was about? Anyways, Seth stormed the church and fought Anderson Cooper for Stefon’s hand in marriage. The characters stormed Seth and Stefon, but DJ Baby Bok Choy held them off. The reunited back in the Weekend Update studio, surrounded by the characters from the sketch, including Jason Sudekis as the Devil. What a heart warming send off for Bill Hader and Seth Meyers. Congratulations, Seth and Stefon Meyers! Here’s hoping you bring Stefon to Late Night.